As Chincoteague Island’s saltwater cowboys make final preparations for the 90th annual pony swim, John Amrhein looks at the evidence that points to the iconic Assateague Island ponies being descended from horses that survived the 1750 wreck of a Spanish warship. The rustic splendor, the crowds, and wild festivity of the Assateague horse-pennings, scarcely retain a shadow of their ancient glory. The multitudes of both sexes that formerly attended those occasions of festal mirth, were astonishing. The adjoining islands were literally emptied of their simple and frolic loving inhabitants, and the peninsula itself contributed to swell the crowd, for fifty miles above and below the point of meeting. All the beauty and fashion of a certain order of the female population, who had funds, or favorites to command a passage, were sure to be there. The wild ponies that roam Assateague Island on the East Coast of the United States are world famous thanks to Marguerite Henry’s children’s classic, Misty of Chincoteague, which was published in 1947. It was made into a movie in 1961 and today is required reading in many schools in the USA. Grandpa explained that the horses swam ashore from a wrecked Spanish galleon and it was the Native Americans who discovered them first. He insisted that it wasn’t just a “legend” that some people wanted to dismiss as untrue. In 1946, when Mrs Henry travelled to Chincoteague Island, Virginia, to witness the Pony Swim and auction, it wasn’t the auction or the Pony Swim that compelled her to travel there. She had heard that these wild horses that call Assateague their home were descended from those that swam ashore from a wrecked Spanish galleon centuries ago. What Mrs Henry and Grandpa Beebe don’t say is that there really was a Spanish galleon wrecked on Assateague Island. On September 5, 1750, the 56-gun Spanish warship, La Galga, drove ashore in shallow water at Assateague, diverted by a hurricane from her intended course from Havana, Cuba, to Spain. The ship did not sink and no-one died on board. However, it took three days for everyone to gain the shore by swimming, rafts, and Native American canoes. Several of the Spaniards drowned in the surf with bags of money tied to their belts. Several others were not strong enough to swim the short distance. An illustration of the 1877 Pony swim from Scribner’s Monthly. Immediately after the Spaniards left, the locals began salvaging and the dismantling the ship. By late October, La Galga had been cut to the water line but she still held the valuable cargo of mahogany planks in her lower hold. In early November, a north-east storm wrenched the gun deck loose, allowing the mahogany to wash ashore. Sand immediately filled in the hull and covered what was left. This event would be remembered by succeeding generations and the sudden appearance of small horses on the island were linked to this shipwreck. The people of neighboring Chincoteague handed down the oral tradition of the Spanish shipwreck for centuries. But that would change after Misty of Chincoteague became so popular. The federal government decided that the people of Chincoteague were being misled by this legend so in 1968 the National Park Service historian published its research on the subject, hoping to settle the issue. When Marguerite Henry heard the legend first hand, she was told that the Spanish shipwreck occurred in the 16th century, otherwise characterized as the 1500s, and that the horses were already on Assateague when the English settlers arrived in the middle of the 17th century. Native Americans were the only inhabitants in the area in the 1500s so there was no-one to make official record of this alleged event. What explains the difference between fact and fiction is the likely confusion over the method of referencing centuries. Many people will mistakenly describe the 1700s as the “17th century”, which is actually the 1600s. One more mistake, repeated by others, puts you back in the 1500s. The National Park Service historian proved that there were no horses on Assateague when the English colonists arrived in the middle of the 1600s. He also discovered that horses were pastured on Assateague in the late 1600s. He concluded that these horses must have been the source of the present wild horses and failed to make any possible connection to La Galga, which he mentioned in his report. His research stopped there. While it is true that the farmers on the mainland who owned Assateague Island used Assateague to pasture their horses and cattle, the owners kept a tight eye on their livestock. When owners died, the court would order an inventory of their possessions which included their Assateague horses and cattle. These records have survived the centuries in the neighboring county courthouses. These records were never consulted by the National Park Service. The author, John Amrhein, Jr., with a model of the 56-gun warship, La Galga, which drove ashore on Assateague Island, Virginia, on September 5, 1750. While some people on the mainland came to believe that the present wild herds merely descended from horses brought over to Assateague in the late 1600s, it is an illogical premise as the horses had value and would not be abandoned. In fact, there is record of a herdsman living on the island in 1696, proof that their cattle and horses were well tended. The horses and cattle would be pastured on Assateague in a manner no different than horses pastured on the mainland. They would be rounded up, sold, traded, mated, and used for transportation. Horses would be shuttled back and forth to the mainland as needed. Horses were a valuable commodity and the inventories not only recorded their description but their monetary value as well. Something happened that contradicts the notion that the horses there today are direct descendants of horses that were carelessly abandonment in the 17th century. In October 1749, there was a northeast storm so severe that Assateague has never seen anything as devastating since. The tide rose fifteen feet and not only inundated Assateague but travelled two miles into the mainland, miles away from the barrier island. It was reported that on northern Assateague that out of sixty horses only one survived and out of five hundred cattle only five. Within a few years after La Galga wrecked in 1750, estate records began describing “beach horses” distinct from others. It was written that in the early 1800s that some of the horses were so small that a tall man might straddle one and touch his toes to the ground. In modern times, the Ash Wednesday Storm of 1962 killed half of the horses on Assateague with a storm surge of seven feet, half that of 1749. Shetland ponies were then introduced to help reestablish the herd, thus diluting the Spanish bloodline that was already in retreat. While the wrecking of a Spanish ship on Assateague on September 5, 1750, is historical fact, the USFWS is trying to convince the American public that the shipwreck itself is only a legend. Some people tried to discredit the story of the Spanish shipwreck as a source [from] which the ponies came. Others would like (now that the ponies are famous and have made Assateague and Chincoteague the talk of the entire country for beautiful ponies) to claim the honor. But go where you will, up and down the Atlantic Seaboard, from Maine to Florida you will not find the ponies. In fact Assateague is home of their forefathers and it’s good enough for them. The “some people” she refers to may well be the federal government, which began discrediting the Spanish shipwreck legend two years before she died. One government archaeologist, when referring to the Spanish shipwreck legend described in Misty of Chincoteague, reduced the legend to a mere “myth … one that requires debunking”. An interior view of the Spanish Warship La Galga (1750). The legend can hardly be reduced to myth when there is historical proof that certain Spanish ships carried horses when returning to Spain. Exactly 128 years to the day, prior to the wreck of La Galga, a Spanish fleet was wrecked in the Florida Keys. Many are familiar with the Nuestra Señora de Atocha of the 1622 fleet discovered by legendary treasure hunter, Mel Fisher, near the Marquesas Key. Not far away was the shipwreck of the Santa Margarita. Archaeologists recovered at least one horse shoe and some horse bones in 1982. This author met Dr Eugene Lyon, the researcher who led Fisher to his discovery. He asked me if La Galga had any soldiers on board and I told him that there were 60 soldiers documented as being on board. He matter-of-factly stated that La Galga most likely had horses on board. While there was no archival evidence for the horses on the Margarita, he conjectured that they belonged to the soldiers who were documented as being on board. When the 1715 Spanish fleet was lost on the coast of southern Florida, archival evidence says that some horses were eaten by the Spanish survivors. While no archival document places them on board at time of sailing, their presence is documented after the fact. In 1991, the Journal of Wildlife Management published the findings of Robin Goodloe and others on the genetic ties of the Assateague ponies. The study’s conclusion was that there was a “close genetic resemblance between the Assateague Island horses and the Paso Fino breed which descended from animals brought to the New World by the Spanish”. The passengers on my boat included a lady from Columbia who stated her grandfather raised Paso Fino horses and that she was extremely familiar with the breed. While watching the band of ponies with the stallion, Puzzle, she became notably excited and repeated and repeated the phrase “Paso Fino” several times. She then explained she had seen the gait characteristic of the Paso Fino breed in one of the horses of the band. She was adamant the pony she observed was a descendant of a Paso Fino horse. Charles George is a maritime attorney, technical diver, and cultural resource advocate. In 1980, this author began his hunt for La Galga. This included searching American archives and contract research in the archives of Spain. It seemed that locating La Galga would be a simple task. Captain Don Daniel Huony, of La Galga, wrote to the Governor of Maryland months after the shipwreck and referenced a survey that put the shipwreck several hundred feet north of the Colonial boundary between Virginia and Maryland. The difference between the present boundary and the 1750 boundary is only two miles. The ship had to lie within a hundred yards of the beach. A thorough ocean survey can be done in the matter of days. The shipwreck was not located in the ocean adjoining Assateague by myself, nor was it located by treasure hunters and government archaeologists. The secret to finding her was found in the same courthouse that contained the secrets of the ownership of the horses. Surveys were recorded that defined the earliest boundaries. More importantly, these records proved that the beach had grown out over the centuries placing it within the Chincoteague National Wildlife Refuge, under Assateague Island, and under the control and ownership of the federal government. Today, archaeologists are mapping the likely location of the shipwreck and have successfully detected some anomalies which appear to have originated from the shipwreck. In 1983, this author met the great-nephew of Clarence “Grandpa” Beebe, who grew up not only hearing the legend that a wrecked Spanish galleon was the origin of the horses, but was told as a youngster that the Spanish ship entered an inlet when she drove ashore, causing the inlet to close. He said that the Native Americans rescued the Spaniards. He was able to come very close to pointing to where the shipwreck site was ultimately discovered. Documents in the Spanish archives confirm that the shipwreck was covered by sand within three days and that the Spaniards came ashore in Native American canoes, echoing the statements of Grandpa Beebe’s great-nephew. Today, the Assateague horses are considered the number one tourist attraction on the Eastern Shore of Maryland and Virginia. Charles George, a maritime attorney from Charleston, South Carolina, is leading the initiative to have the shipwreck site of La Galga determined eligible for the National Register of Historic Places. To date, the Federal Historic Preservation officer has refused to apply the criteria to make the required determination. Part of the evidence presented is the narrative presented here. Mr George is passionate about the proper treatment of cultural resources. When referring to the evidence that proves the Spanish shipwreck legend, he says that “collectively, it’s definitive”. 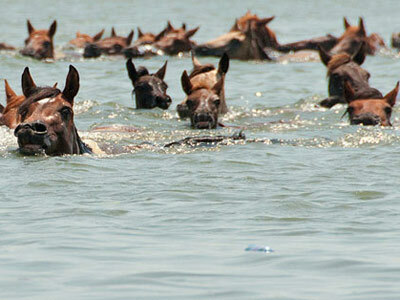 There is a preponderance of evidence that now proves the Spanish shipwreck is the origin of the horses. “People go to prison on less evidence than is presented here.” As for the government’s “more plausible theory”? “It doesn’t hold water,” he says. Why does the federal government refuse to acknowledge the Spanish origin of the Assateague ponies? Many on Chincoteague Island believe that they would like to get rid of them completely since they are merely “feral”. If it becomes generally accepted (once again) that the horses came from an historic Spanish shipwreck, then it would become difficult to tamper with the herd, a cultural resource and tourist attraction that drives tourism in the region. In their published planning documents they have announced that the herd will be reduced. In 2007 John Amrhein published The Hidden Galleon; The true story of a lost Spanish ship and the wild horses of Assateague Island. Has any DNA research been done on the Assateague herds ? Simple and very definitive. The US Govt agencies seem determined to eradicate all non- domestic herds, period ! They, like the First Nation peoples, need all the advocates they can get ! I agree, doing DNA testing is a simple, unbiased method of confirming the pony’s origins. I agree with the others who suggest DNA testing. I thoroughly enjoyed the article–thank you!